I've never made an ATC (artist trading card) before. The name always scared me. I am not an artist, I'm a paper crafter. There's a difference. But yesterday I tried my hand at an ATC and I liked it! This is for the limited supply challenge this week. It's supposed to be a lunchbox note. I think the idea is SO cute. I think I've been a bad wife all these years. I've just been writing directly on to hubby's napkin. I was supposed to be making these adorable cards! Who knew? An ATC is basically anything on paper that is 2.5x3.5 inches. The area is small and super easy to work with. I just love it! I will definitely being doing this again. Also, as a note, my friend just sent me a BUNCH of paper, so a lot of what I have is unmarked from unknown origins. If you know what is it, please let me know and I'll update. Thanks! 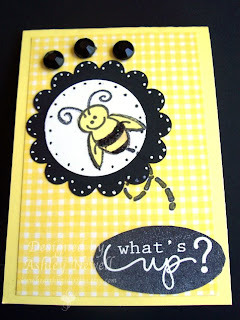 Love the bee inside the scalloped circle! That little bee is too cute!